Step right up to this super cute Lents bungalow, with sweet entryway porch leading in to your sunlight-dappled new home. This is an easy open floor plan that’s both charming and functional, with smart window placement to let in all that gorgeous light. Enjoy a comfortable, spacious kitchen with stainless steel appliances, good cabinet and counter space, and warm hardwood floors, with a sliding door leading out onto a private deck. Second bedroom with additional living space potential on the upper level. Outdoors, the fenced yard/patio awaits your vision, maybe rad summer BBQs with hanging lights, comfy furniture to lounge in, and lots of leafy greenery? Surrounded by much of what makes SE attractive – Cartlandia and the Portland Mercardo food cart pods, a ridiculous amount of parks – Lents Park, Glenwood City Park, Mt. Scott Park and Community Center with an outdoor pool – Johnson Creek, and loads of shopping and delicious Asian eateries. 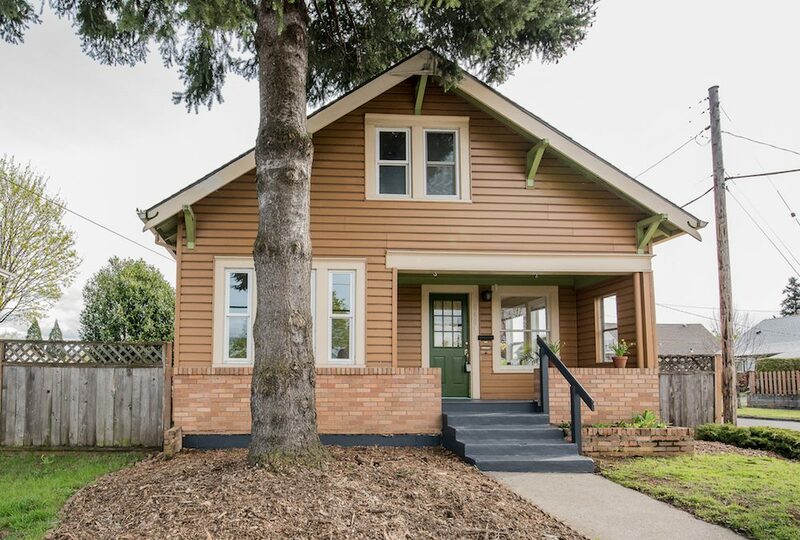 A seriously cool lil’ PDX bungalow starter home in a rad location for a great price, y’all.